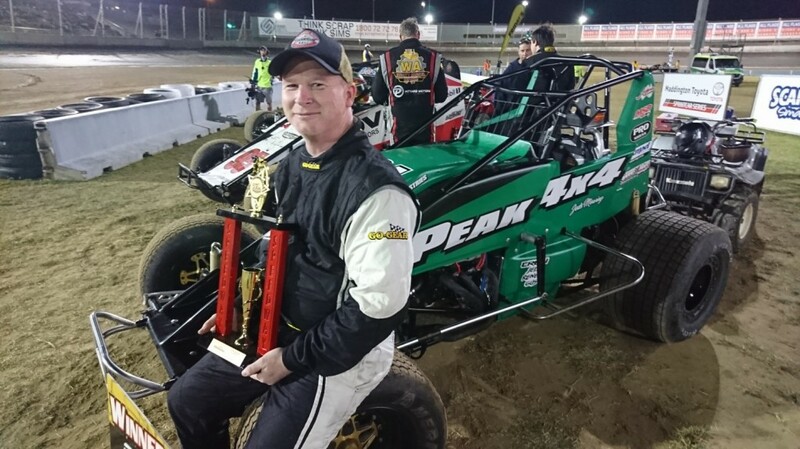 Daran Humfrey has tonight claimed the first Wingless feature at the Perth Motorplex for season 2018/19 in spectacular fashion, with the race quite literally coming down to the line! All sixteen cars that started the night would take the green for the feature, with Daran Humfrey from pole and joined by Ash Hounsfield on the front row. 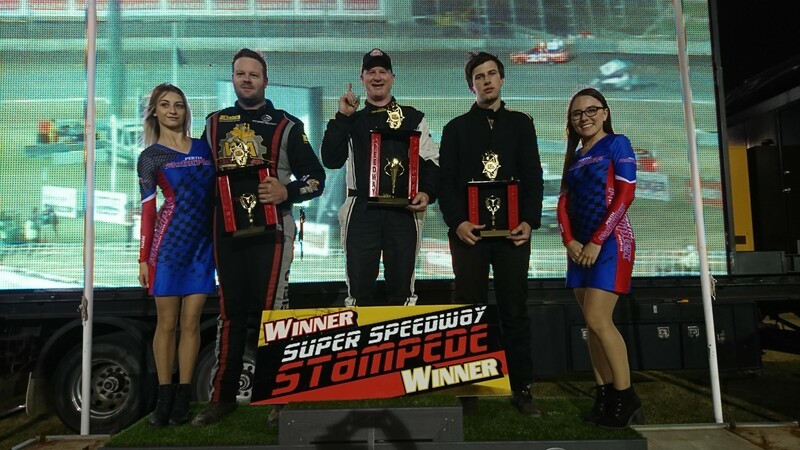 As the race went green Humfrey grabbed the lead as Hounsfield and team mate Chad Pittard battled it out for second place supremacy in the opening stanza. Hounsfield then pulled ahead while behind them Brendon Wedge, Matt Iwanow and Brad Fitzgerald were fighting it out in an intense battle which ended with two laps complete after Nathan Walton spun to bring out the yellows. On the restart Humfrey would again lead away, while Pittard took his chances and passed Hounsfield for second. Brendon Wedge also made his way into fourth position after charging past a couple of cars and all of a sudden the top four pulled away, Wedge putting pressure on Hounsfield for third. State Champion Matt Iwanow began to claw his way back into contention, sitting on Wedge’s tail as the top five desperately looked for a way past each other, while Humfrey slowly began to build a gap. Iwanow made his move on Wedge on lap eleven and made it stick, while Humfrey would find himself in lapped traffic on lap thirteen, allowing the fighting duo of Pittard and Hounsfield to close the gap. With one and a half to go Pittard made a move on Humfrey for the lead, the two making contact as they crossed the line with one lap remaining which allowed Hounsfield right in on the action. For what was an epic final lap all three drivers were fighting it out in incredibly close quarters, then in the final corner Hounsfield went right up against the fence as Humfrey went low, Hounsfield drawing alongside Humfrey as they crossed the line, but it wasn’t quite enough, Humfrey winning by 0.010 seconds. Hounsfield was a valiant second while Pittard finished third in what was an incredible feature race, with all sixteen starters also able to finish. Excitingly, the Wingless Sprints will be back in action at the Kwinana Cup event on November 24. Heat One, 8 laps: 1. WA1 Matt Iwanow, 2. 95 Ash Hounsfield, 3. 56 Brendon Wedge, 4. 81 Nathan Walton, 5. 5 Brad Fitzgerald, 6. 29 Chad PIttard, 7. 78 Matty Fellowes, 8. 33 Troy Tomlinson, 9. 6 Alex Robinson, 10. 12 Jake Robinson. DNS: 31 David Worrall. Total Time: 2.30.997. Winning Margin: 0.477. Fastest Lap: 18.012 Chad Pittard. Heat Two, 8 laps: 1. 84 Daran Humfrey, 2. 95 Ash Hounsfield, 3. 17 Brad Taylor, 4. 42 Mitchell White, 5. WA1 Matt Iwanow, 6. 47 Cody Dobinson, 7. 31 David Worrall, 8. 78 Matty Fellowes, 9. 2 Brody Miller, 10. 12 Jake Robinson, 11. 6 Jake Robinson. Total Time: No Time. Winning Margin: 2.320. Fastest Lap: 17.965 Daran Humfrey. Heat Three, 8 laps: 1. 29 Chad Pittard, 2. 84 Daran Humfrey, 3. 81 Nathan Walton, 4. 56 Brendon Wedge, 5. 5 Brad Fitzgerald, 6. 2 Brody Miller, 7. 47 Cody Dobinson, 8. 42 Mitchell White, 9. 17 Brad Taylor, 10. 33 Troy Tomlinson. Total Time: 2.24.375. Winning Margin: 0.403. Fastest Lap: 17.623 Nathan Walton. Feature, 15 laps: 1. 84 Daran Humfrey, 2. 95 Ash Hounsfield, 3. 29 Chad PIttard, 4. WA1 Matt Iwanow, 5. 56 Brendon Wedge, 6. 5 Brad Fitzgerald, 7. 42 Mitchell White, 8. 47 Cody Dobinson, 9. 2 Brody Miller, 10. 31 David Worrall, 11. 81 Nathan Walton, 12. 78 Matty Fellowes, 13. 12 Jake Robinson, 14. 17 Brad Taylor, 15. 6 Alex Robinson, 16. 33 Troy Tomlinson. Total Time: No Time. Winning Margin: 0.010. Fastest Lap: 17.406 Daran Humfrey.